The Trimble BD982 GNSS receiver module is a dual-antenna receiver designed for guidance and control in applications that require centimeter accuracy and precise heading. The Trimble BD982 GNSS receiver module is a dual-antenna receiver designed for guidance and control in applications that require centimeter accuracy and precise heading. Ideal for custom hardware solutions, the BD982 receiver module can receive varied satellite signals including GPS L1/L2/L5 and GLONASS L1/L2. GNSS systems with single antenna are known to have trouble determining the antenna position relative to the vehicle and the object in low dynamics environments. The usual solution of using external sensors causes drifting when static, however. 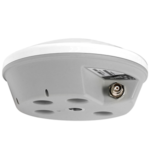 Using dual-antenna GNSS receiver modules like the Trimble BD982 is economical and much more effective. 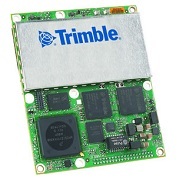 Trimble based the BD982 GNSS receiver module on the 220-channel Maxwell 6 chip capable of receiving inputs from both antennas and calculating multiple-constellation GNSS RTK baselines. This solves the problem of determining vehicle heading in challenging static or low dynamic environments. The Trimble BD982 allows fast data transfer and web browser configuration through connectivity options that include Ethernet, RS232, CAN or USB. A single connection to the board also provides less than 1/10 of a degree (2 meter baseline) heading accuracy and centimeter accurate positions. In line with the company’s commitment to provide Galileo-compatible products, the BD982 receiver module can track the Galileo GIOVE-A and GIOVE-B experimental satellites to evaluate signals and for testing. The end user also has the option to use OmniSTAR VBS, XP, G2, and HP services for GNSS performance levels that reach down to the sub-decimeter. The compact form factor of the BD982 is a single-board solution that ensures easy integration in applications where lightweight is a requirement. Software commands are easy to use and significantly reduce development times. You have the option to upgrade all software features with a password and to upgrade functionalities as requirements demand. Trimble’s trademark dependability means that the BD982 is tested to perform reliably in grueling environments your products are designed for. The drop-in and solder-down module measures 100 mm x 84.9 mm x 11.6 mm and weighs 92 grams. Connectors included are 40-pin header I/O and 2 x MMCX receptacle antennas. 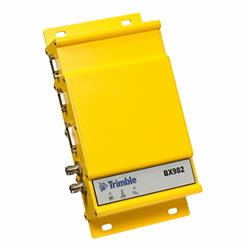 The Trimble BD982 GNSS receiver module is available to original equipment Manufacturers (OEM) and system integrators. Choose from different configurations from L1 DGPS upwards.